Here's one USB drive that you're not going to lose on your desk or in your bag. Get the toy block USB drive in red, blue, black, or yellow for $21.99 each at Escapist Deals. Consider these colorful proof that your office gear doesn't have to be boring. This tiny drive looks like fun building blocks, but they mean serious business. Each one has a USB 2.0 interface and 32GB of portable storage. It comes with a sliding cap that protects the device and your photos, documents, music files, and videos. The USB drive comes in red, blue, black, and yellow - grab one, or collect all four. Add a little fun to your office. 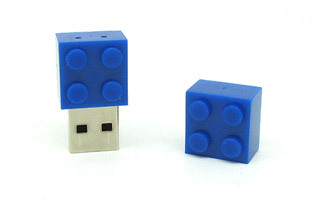 Get the toy block USB drive for $21.99 each at Escapist Deals.